A jump starter is probably one of the best tools you can buy for your car. It can be a real life saver if your battery dies when you are at home or on the road. We think that the best jump starter you can buy today is the Stanley J5C09. With a jump starter you don't have to worry about needing another car as a donor, or if the jumper cables are going to be long enough. They can also double up as a power supply for charging portable devices or as an inflator. Here are our top 5 jump starters, reviewed in detail. Featuring a hefty jump starting capability and cool features like a tire compressor, LED light and USB ports, the Stanley J5C09 is part of a range of excellent jump starters from Stanley. With a peak power delivery of 500 Amps, this thing can jump-start most cars, be it four, six or eight cylinders, petrol or diesel. You also don’t have to worry about running out of power too quickly. Once charged, you should get a few starts out of it and it should retain its charge for around a month in storage. I find that cheaper quality jump starters have a problem with storing charge over longer periods. The Stanley J5C09, however, holds charge very well. This is down to the high-quality polymer used in the battery that keeps the ions intact and ready to kick in when needed. 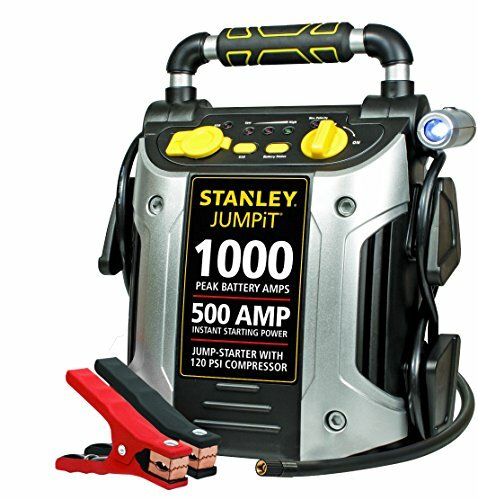 Stanley jump starters are very straight forward to use and only take a few seconds to set up. 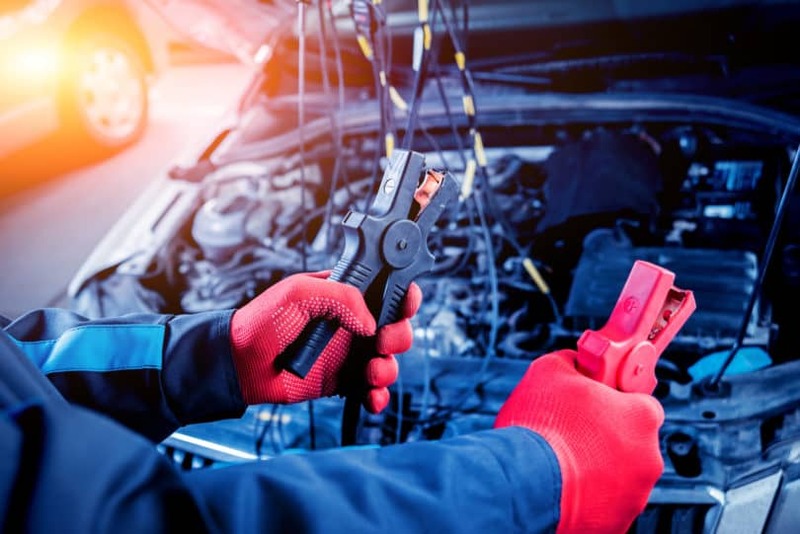 It's just a matter of hooking up the cables to the positive and negative terminals on your vehicle, turning on the jump starter and then starting your car. Even if you hook up the cables the wrong way around, the starter has a built in alarm to let you know. It also has a built-in charge protector that prevents charge loss caused when positive and negative terminals come in contact with each other. This jump starter is rugged, and well built using high quality materials. Ergonomically, it's easy to move around with ports, air hoses, switches and gauges all well arranged. 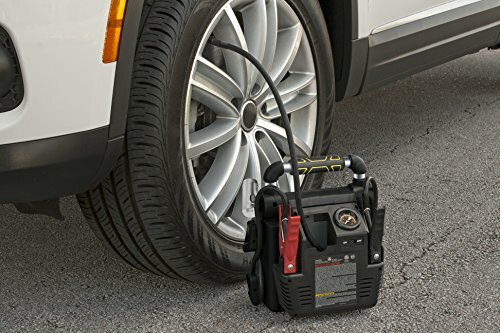 You can also use this jump starter as a portable power source and tire inflator. It comes with a USB charging port, a 120 psi compressor and 270-degree rotating LED light. The USB port can be used for charging portable devices, and there's also a 12V DC outlet for running small appliances. The LED light is handy if you're trying to use the unit in the dark. The portable compressor is a little bit noisy but is ok for inflating tires occasionally. ​​​​​The DBPower 600A is a powerful, compact jump starter. The 600 amps of peak current it delivers will start you car up to 20 times between charges. It should have no problem jump starting a vehicle with up to 5.2L diesel engine or 6.5L gas engine. This makes it a great option for anything from an SUV, Sedan, MPV or truck to a small hatchback. 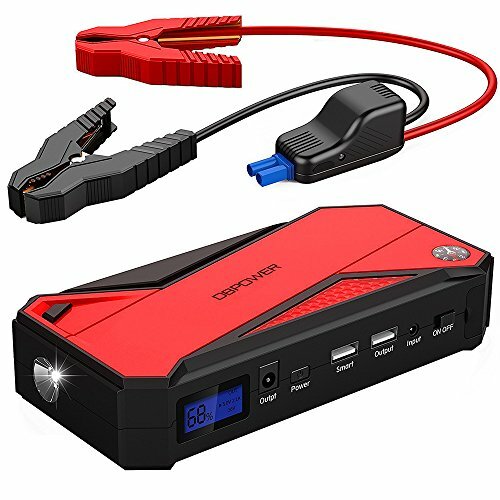 The jump starter battery itself has a charge capacity of 18000mAh and charging it takes about an hour. Simply plug it into a standard wall outlet and wait for the charge light to turn green. Like most of these jump starters, it's designed to be easy to use, even if you're a complete novice. To use, plug the red and black jumper terminals to the battery and press the small button on the cable. When the red light on the jumper turns green then you're good to go. This is a portable jump starter and is roughly the same size as a portable power bank. The body is made of plastic but it feels fairly tough and is easy to handle. It also comes with a handy zipper bag that keeps it clean and also has room for all of the included accessories. Although it lacks a tire compressor, it does come with a USB charging port that will charge laptops, smartphones, and other devices. The charge capacity of 18000mAh allows you to fully charge your laptop multiple times. There's also an LCD screen that tells you what power you've got left and an analogue compass for some reason! The emergency flashlight isn't bad, and is bright enough to see under the hood in the dark. 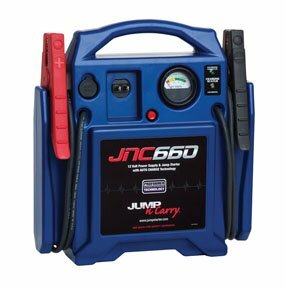 The Jump-N-Carry JNC660 is a powerful, no nonsense, heavy duty jump starter. It may not have some of the frills of other starters, but it will start your car no matter how dead the battery is. Featuring a massive 1700 peak amps this can jump-start a wide range of vehicles. It can provide a stable power output of 425 Amps and you should get a few engine starts before it runs out of power. The internal lead-acid battery is replaceable and should only need to be charged every few weeks when left in storage. It takes about 5 to 6 hours to fully charge, and if you accidentally leave it charging, the overcharge protection protects the battery from damage. 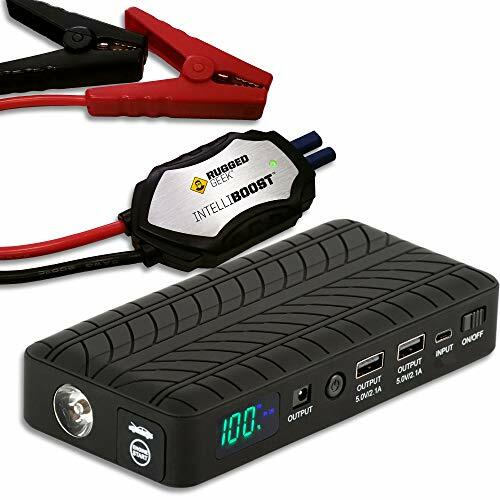 This jump starter is not as compact as some of the others we have reviewed here. Weighing around 18lbs, it's not the lightest jump starter, but it comes with a decent top handle for lugging it about. It's also easy to use. Simply hook up the long (46 inch) heavy duty leads with their industrial grade hot jaw clamps to the battery terminals, and leave for a few seconds before trying to start your engine. If you're not sure what you are doing, there are clear instructions in the box, so you can't go wrong. This is a heavy duty jump starter, that will stand up to plenty of use and abuse. Unlike other popular jump starters, it lacks features like an air compressor, compass, LED light and USB charging port. There is a 12-volt DC outlet included that can charge phones and tablets. There's also an analogue voltmeter that shows the remaining battery charge or charge status. 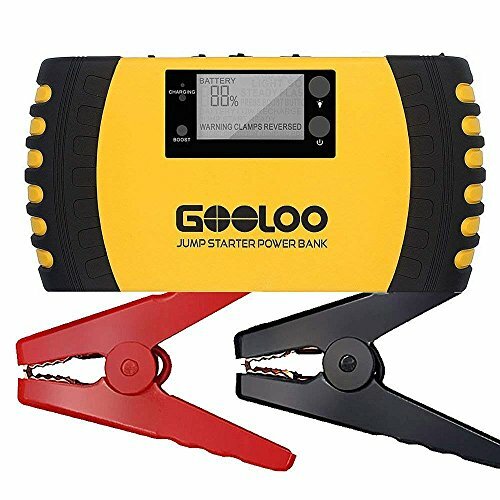 With a peak power output of 1000 amps, this GooLoo jump starter will start just about any gas engine up to 8.0L (6.0L diesel) even in cold temperatures. It's also compact and lightweight so is easy to manage and store. This version of the GooLoo starter gives out 1000 amps of power, and should be good for up to 30 starts between charges. The internal polymer battery has a capacity of 20,800mAh and takes around 8 hours to charge. GooLoo say the battery has a lifespan of 1000 cycles, but this may be less depending on how you use it. As well as a jump starter, you can use it as a portable charger (dual USB ports and 12V/10A DC output), an SOS lighting signal for help and as an LED flashlight. To start your car, hook up the cables, wait a few seconds and start the engine. It comes with a well-written instruction manual that gives you a full run down on how to use it. It can also be used to charge portable devices using the USB ports. The DC output can be used to power a tire inflator, a portable vacuum cleaner, car refrigerator and other 12V devices. This is a well specced jump starter with some nice features. It should be strong enough to start most vehicles if they have a flat battery. On the downside, the battery is not replaceable, so may let you down if you plan on charging/recharging a lot. There are also some mixed reviews online when it comes to reliability, but customer service appears to be good. Beautifully designed and made in the USA, the Rugged Geek RG1000 is another powerful yet portable jump starter. With a supply of 500 amps of peak current, Rugged Geek RG1000 can jump most passenger vehicles. Family cars, motorcycles, boats, and small trucks start without an issue. Also, through its 14000mAh battery, it can perform 20 consecutive jumps. It has a lower battery capacity compared to other jumpers. But it is also priced lower. 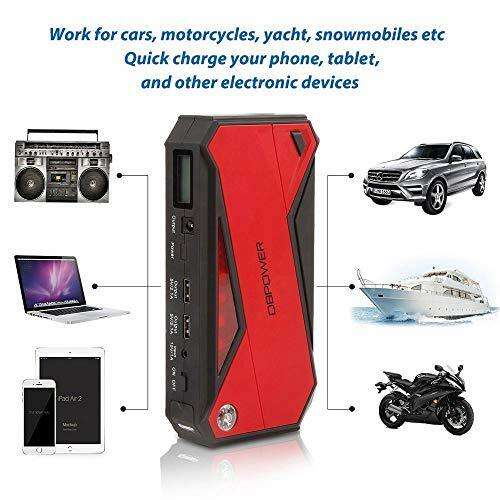 So if you are looking something reliable and powerful enough to start a regular car, this jump starter can be perfect for you. You ca Rugged Geek RG1000 to replace the function of dead batteries. Many customers have found this jump starter helpful in starting their the. To use hook the battery clamps, red wire to positive and black to negative and turn on the switch. Notice the lights turning green and then turn the ignition. The car should start immediately as normal. One time use takes up about 10% of the battery charge. Through LED display you can know this and the power remaining in it. Rugged Geek RG1000 is very good looking. We all love good looking gadgets and this is one of them. The rugged appearance of the jump starter looks like it means serious business. All the ports, switch and the power button is located at the right spots. Even in total darkness, you can easily identify them. The lithium-ion batteries hold and discharge charge quite well and are made of high-quality polymer. It weighs less than a pound and is small enough to keep it in your glove box. If you run out charge on your phone, digital camera, Bluetooth headset or tablet, with 2 high power USB ports provided, you can charge them full many times. Also, it comes with a dedicated laptop charging port or variable output port which is compatible with most laptops in the market. 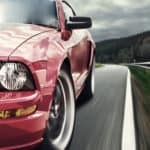 The most commonly added 12V cigarette lighter charger is helpful to power 12V devices. The soft carry pouch given encloses it well and keeps the battery safe from temperature fluctuations. It comes included with 3 in 1 USB cable with USB-C, Micro USB, and Lightning attachments. The LED flashlight is quite bright and can be used as strobe, SOS or like a simple torch.